Titans of the Graphic Novel: An Evening with Harvey Pekar and Alison Bechdel, was presented at the Clark County Library on Saturday, April 24, 2010 at 7 p.m., as part of the Reading Las Vegas program sponsored by the Las Vegas-Clark County Library District. 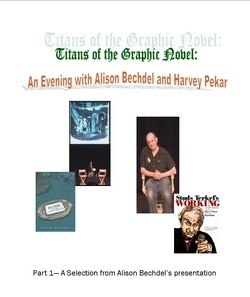 Together, Harvey Pekar and Alison Bechdel discuss the power of graphic novels. Part 1 presents Alison Bechdel. Alison Bechdel is a cartoonist best known for her syndicated comic strip Dykes To Watch Out For which she started in 1983. Bechdel’s comic covers everything from love to politics involving primarily lesbian characters. Other works by Bechdel include Fun Home: A Family Tragicomic, the story of Bechdel’s relationship with her father. It took seven years to write, and was named by Time magazine as the best book of 2006. Other books by Alison Bechdel can be located in the Library catalog. Perhaps best known for his autobiographical series, American Splendor, Harvey Pekar, who passed away in July 2010, was a comic book writer who saw his self-published series turn into a cult classic with a large and loyal fan base. In 2003, Splendor was adapted into a critically acclaimed film starring Paul Giamatti and Hope Davis. First published in 1976, Splendor covers Pekar’s everyday life ranging from his job as a file clerk to his relationships with his friends and family. Other stories include situations he had with his car, his health and anxieties in general. Other books and DVDs by Harvey Pekar can be located in the Library catalog.